When in Manila, get a dose of health and happines just outside of the city at the Ilog Maria Honeybee Farm in Silang, Cavite. The seven hectare, solar powered farm is fronted by a quaint shop that showcases the the array of products made from the hard work of honeybees. Virgin honey, bee pollen, propolis, royal jelly and beeswax straight form the beehives are amongst many of the natural products on display. Beauty products such as health soaps and shampoos, throat and breath spray, lip balm and even tooth powder are formulated from a honey derived base. They also make honey wine and honey cider vinegar which has natural medicinal properties. Nothing goes to waste in their bee keeping business as even the beeswax is used to make ornamental candles. The farm is lush, surrounded with fruit and flower bearing trees and plants, providing all the raw materials for the bees to make honey. Ilog Maria Honeybee Farm gathers pollen from Italian Honeybees. These honeybees ave the ability to choose the ripest pollen, moistening the grains with nectar and forming it into a pellet with its hind legs. Life is good on the Ilog Maria Honeybee Farm, and it should be, as it was born from a vision for a better life. Leaving behind an astronomically successcul career in the business world, Joel Magsaysay sought simplicity and happiness and found it in the life of bees. Transforming his hobby into a business, Joel went on to developing his family plot into a bee farm and is now regarded as one of the Philippines’ leading apiculturists. His wife, Violaine, had also been keeping bees for several years before they met and together they built Ilog Maria Honeybee Farm into the successful, environmentally sustainable business it is today. Their products are so effective that they even export worldwide. The duo may be busy as bees, but they do it to help others and have found happiness in a simple, spirit grounded life. When in Manila, we could all take a break from a hectic lifestyle and let nature do the work for us. We can find refuge in a place like Ilog Maria Honeybee Farm, with honey to heal our bodies and the peaceful, natural surroundings to soothe our soul. The fruit of bees is desired by all, and is equally sweet to kings and beggars and it is not only pleasing but profitable and healthful; it sweetens their mouths, cures their wounds, and conveys remedies to inward ulcers. The only reason for being a bee that I know of is to make honey…. And the only reason for making honey, is so as I can eat it. 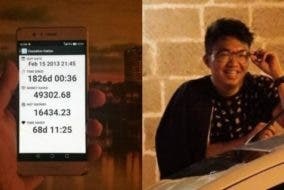 INSPIRING: This former chainsmoker saved over Php 45,000 since he stopped smoking, here’s how he DID IT! LOOK: Mom sees how busy her daughter is bussing tables at work…and starts to help her!